The community of Laramie, Wyoming came together with strangers across the country in a touching tribute to a US soldier who never got the chance to finish a project which was to become a significant gift for his wife. Before being deployed to Afghanistan with the National Guard, Captain Bruce Hays paid an auto mechanic $17,000 to transform the rusty shell of 1959 Chevy truck into a surprise gift that would remind his wife of fond memories with her father, who drove the same model. While Bruce was serving overseas, he was killed by a roadside bomb. To make things worse, the unscrupulous mechanic had left town with all the money. The truck remained a heap of unfinished business and sorrowful regret until word spread and the community rallied to deliver one last gift for the fallen husband and father. A website was set up and auto enthusiasts from across the country joined the project donating car parts, like these, to help complete the restoration of the antique pickup. As a token of thanks, each contributor received a commemorative gift for their involvement. 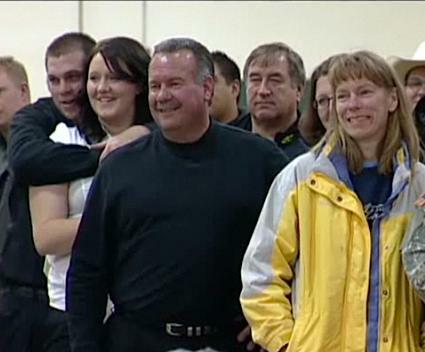 A ceremony was held unveiling the truck, with dozens in attendance, as the keys were turned over to Bruce’s wife.